from across the globe, received thousands of entries from more than 95 countries. 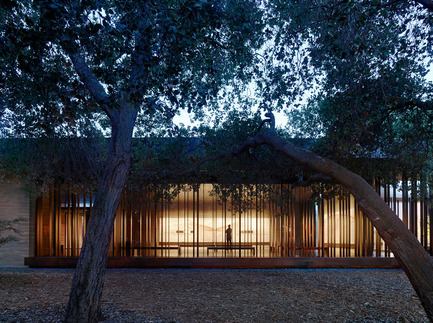 The Windhover Contemplative Center, designed by Aidlin Darling Design, is a spiritual retreat on the Stanford campus to promote and inspire personal renewal. Using Nathan Oliveira’s meditative Windhover paintings as a vehicle, the center provides a refuge from the intensity of daily life. It is intended for quiet reflection throughout the day for any Stanford student, faculty, or staff member, as well as for members of the larger community. Nathan Oliveira's renowned Windhover series is named after "The Windhover," a poem written by Gerard Manley Hopkins in 1877. 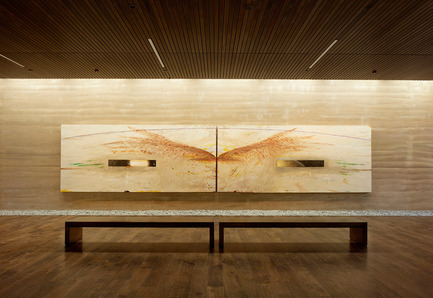 The five paintings were inspired by kestrels swooping above the Stanford foothills. Oliveira felt the calming power of these works and believed they should hang together in a place set aside for contemplation. The Center is conceived of as a unification of art, landscape and architecture to both replenish and invigorate the spirit. The sanctuary is located in the heart of the campus, adjacent to a natural oak grove. 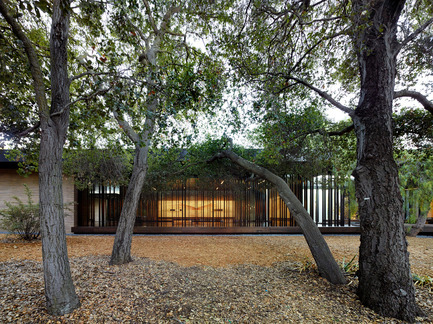 The extended progression to the building’s entry through a long private garden, sheltered from its surroundings by a line of tall bamboo, allows members of the Stanford community to shed the outside world before entering the sanctuary. Within, the space opens fully to the oak grove to the east and the Papua New Guinea Sculpture Garden beyond. Louvered skylights wash the monumental 15 to 30 foot long paintings in natural light. The remaining space is kept intentionally dark to focus the visitor’s attention on the naturally highlighted paintings and the landscape beyond. 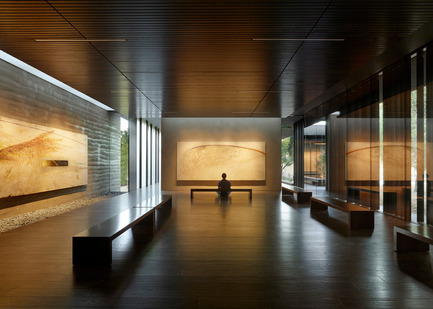 Thick rammed earth walls and wood surfaces further heighten the visitor’s sensory experience acoustically, tactilely, olfactorily, as well as visually. 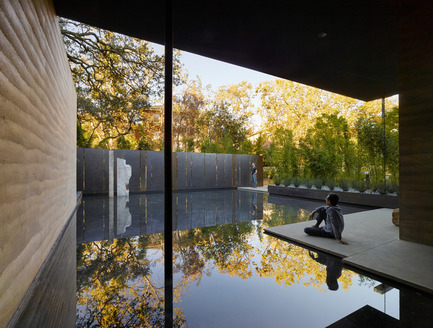 Water, in conjunction with landscape, is used throughout as an aid for contemplation; fountains within the main gallery and the courtyard provide ambient sound while a still reflecting pool to the south reflects the surrounding trees. Exterior contemplation spaces are integrated into the use of the center, allowing views to the natural surroundings as well as to the paintings within. From the oak grove to the east, visitors can view the paintings glowing within the center without accessing the building, effectively creating a sanctuary for the Stanford community day and night. With a shared interest in exploring design across a wide range of scales, programs, and disciplines, partners Joshua Aidlin and David Darling started Aidlin Darling Design around a woodshop in 1997. 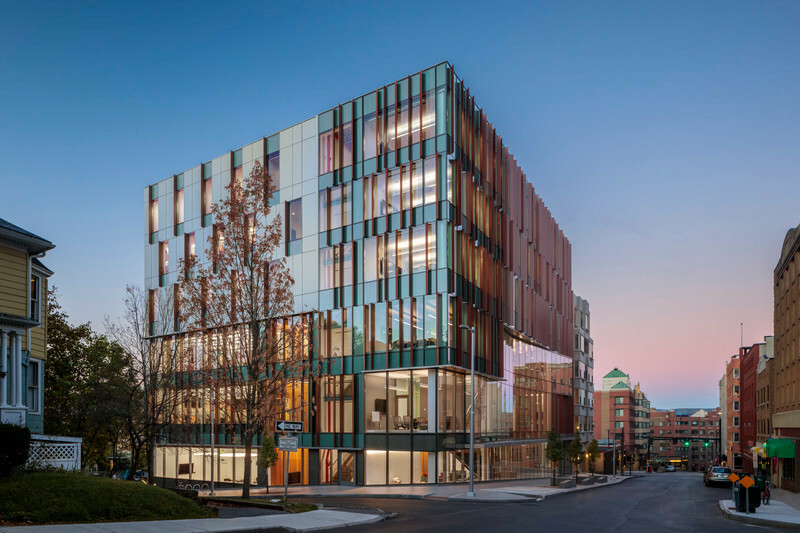 With an emphasis on designing for all of the senses they have cultivated a diverse and collaborative studio that acts as the creative hub for an extended network of builders, fabricators, artists, engineers, chefs, and other collaborators. 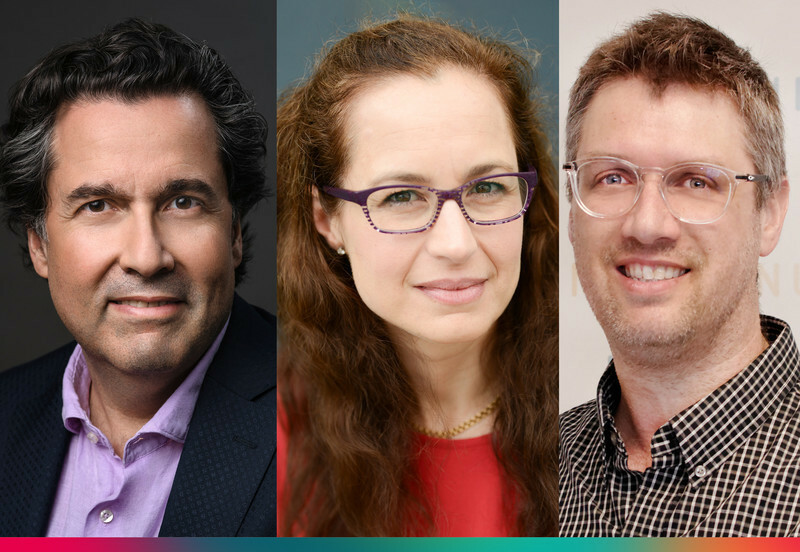 The firm’s work explores a closely held conviction that design can enlighten the human spirit by engaging all of the senses. 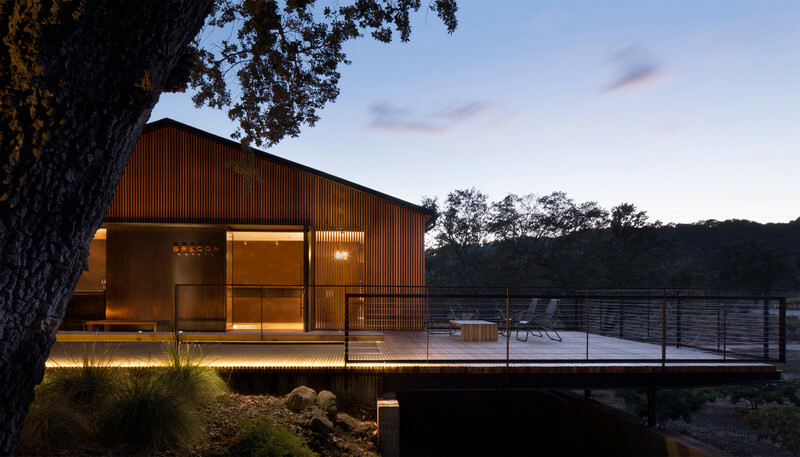 This notion is reflected in a diverse range of recent projects including a restaurant in the new SFMOMA, a LEED Gold brewery in San Leandro, a high school in Santa Rosa, a Cultural Arts Center in San Francisco, a Contemplative Center on the Stanford University campus, and several wineries that push the boundaries of sustainability in agriculture and building. 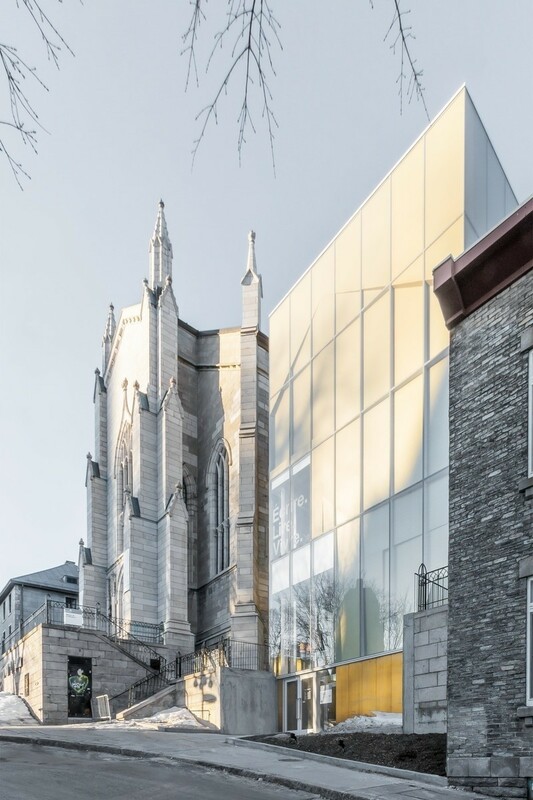 In recent years, the firm has garnered over 125 regional, national, and international awards including Smithsonian Cooper-Hewitt’s National Design Award for their body of work, a James Beard Award, five American Architecture Awards from the Chicago Athenaeum, two International Civic Trust Awards, and several regional and national awards from the AIA, IIDA, and ASLA. 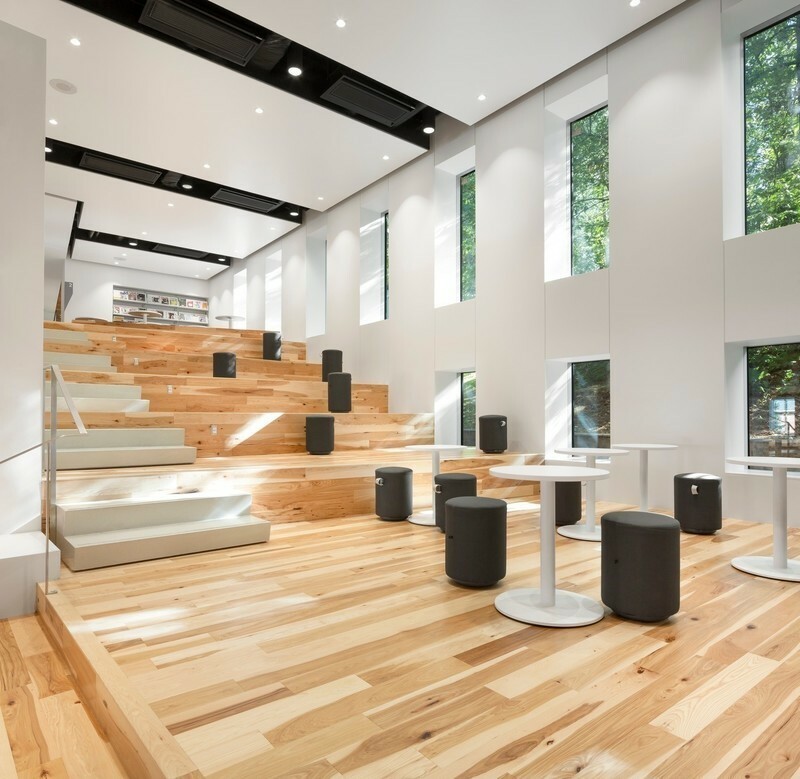 The annual Architizer A+Awards honor the best architecture, spaces & products. 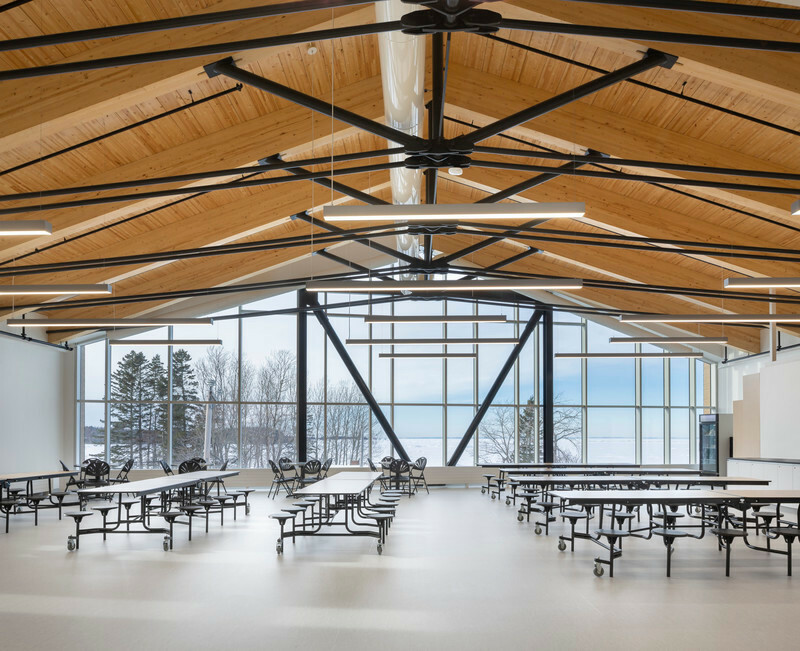 Now in their fourth year, the Architizer A+Awards is the largest awards program focused on promoting and celebrating the year’s best architecture and products. 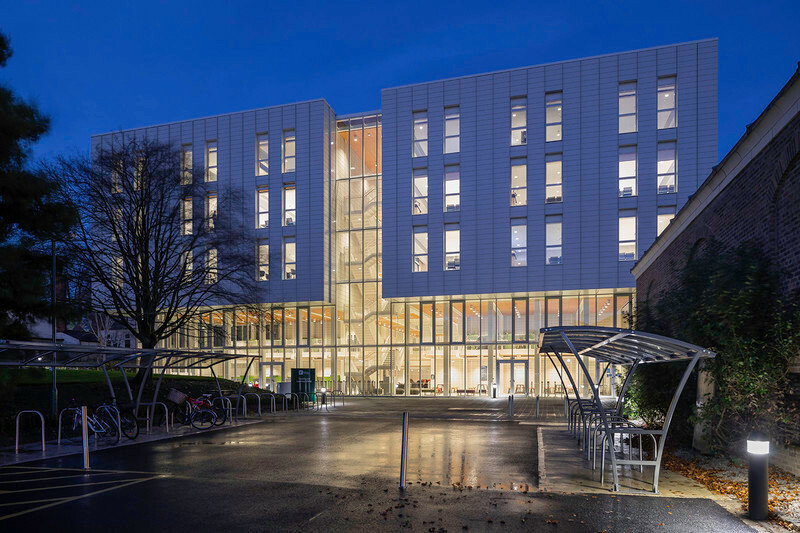 Its mission is to nurture the appreciation of meaningful architecture in the world and champion its potential for a positive impact on everyday life. View from the Oak Grove during daylight hours. The paintings are washed in daylight within the darker interior contemplative spaces. 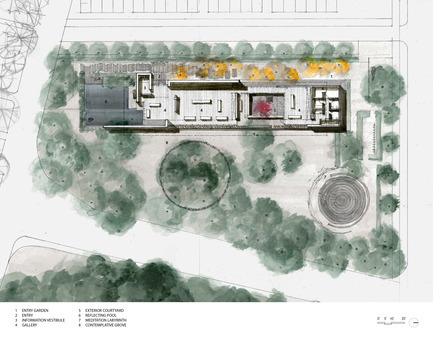 The Center is conceived of as a unification of art, landscape and architecture to replenish and invigorate the spirit. Nathan Oliveira’s “Big Red” greets visitors upon entering the building. 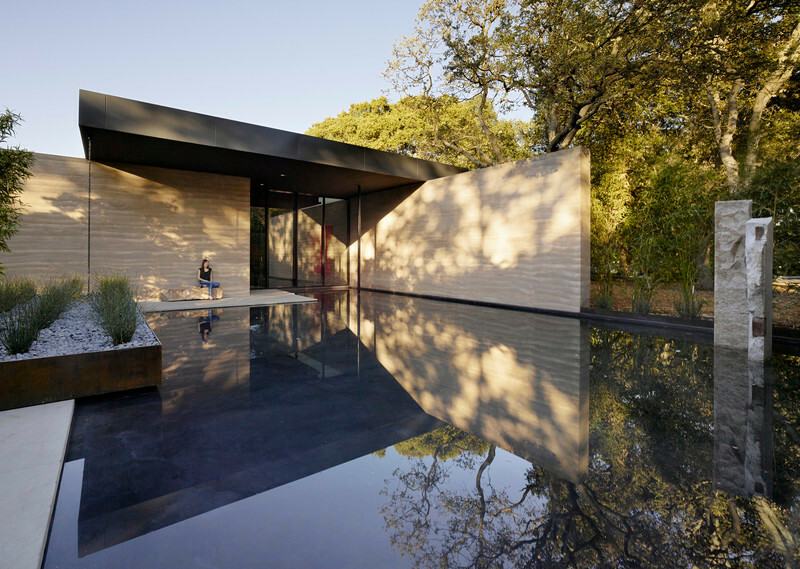 The rammed earth wall extends from the entry to the reflecting pool beyond, blurring the line between interior and exterior. Nathan Oliveira’s “The Windhover I A and I B” diptych. 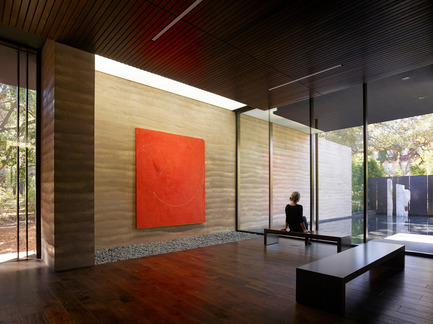 The mix design and texture of the rammed earth were carefully calibrated to complement the paintings. Finish materials and lighting are kept intentionally dark to focus the visitor’s attention on the paintings. The courtyard provides visitors the ability to experience the adjacent oak grove within the protection of the three-sided courtyard. 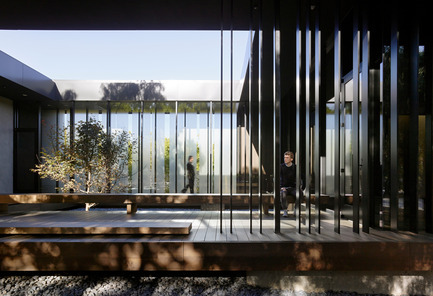 A glass enclosed bridge leads visitors to the northernmost gallery space while providing intimacy to the east facing courtyard. The space opens to the oak glade beyond, extending the visitor’s experience into the landscape. 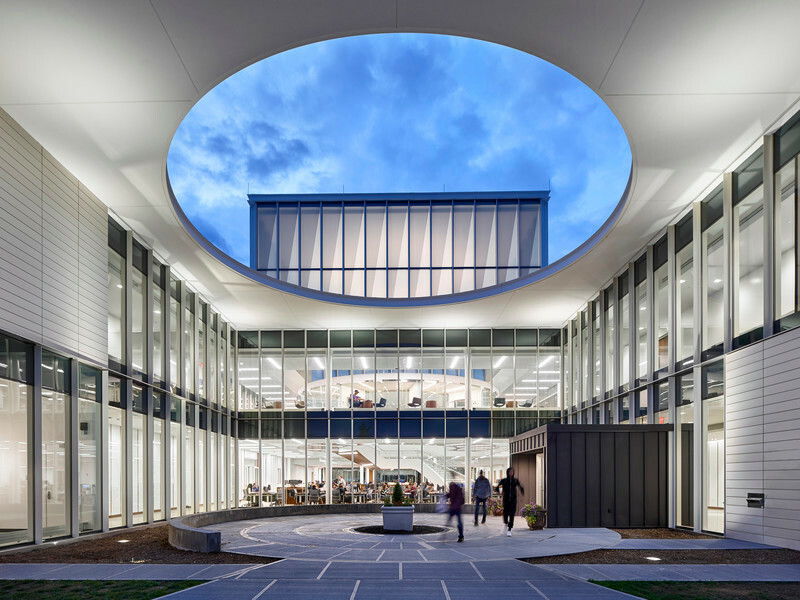 Lifted two feet from the ground with strategically placed benches along its length, the courtyard provides visitors the ability to experience the adjacent oak grove within the protection of the three-sided courtyard. 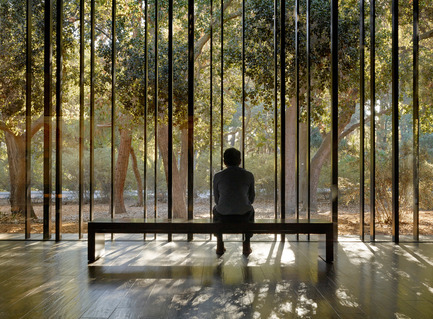 A stone bench salvaged from Stanford’s “bone yard” provides a private spot for reflection. 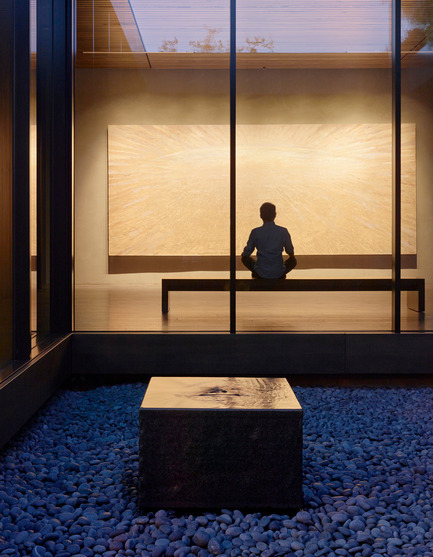 Water, in conjunction with landscape, is used throughout as an aid for contemplation; fountains within the main gallery and the courtyard provide ambient sound while a still reflecting pool to the south reflects the surrounding trees. A fountain provides ambient sound to support contemplation while the fully glazed wall beyond allows views in the North Gallery. View from the Oak Grove at dusk. 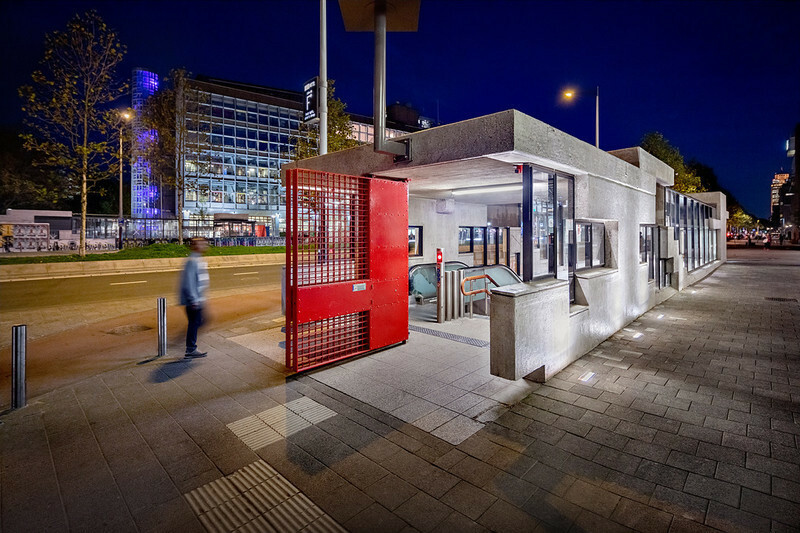 The paintings are lit through the evening hours allowing visitors to access them visually at any time.